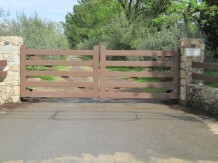 We take pride in building you an entry gate you’ll love. 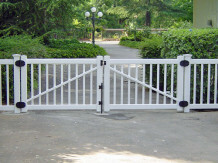 Whether its for security or decoration, built out wood or steel, we can fabricate it. Note: we do everything EXCEPT for the automatic gate OPENER – all automatic gate operators will need to be installed by others. Since we are steel fabricators we can create anything you can imagine. In this gallery we have many photos of past projects to give you an idea of how you can personalize your design. We also have access to a CNC LASER cutting machine that allows us to make even more intricate custom designs. Just as with our steel arched gates, since we are steel fabricators we can create anything you can imagine. The gates are flat across the top instead of arched or scalloped but the limitless design possibilities are the same. Use this gallery to give you design ideas and inspiration. We also have access to a CNC LASER cutting machine that allows us to make even more intricate custom designs. There are limitless design ideas for wood gates. 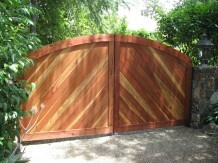 Our wood driveway gates normally are constructed on a steel frame with wood attached. What ideas would you like to try for a really unique entrance to your home? Check out a sample of our creations over the years. These gates are either built of all vinyl or have steel frames with vinyl attached. 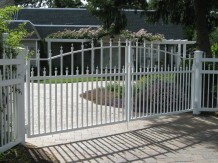 We use Bufftech vinyl products for our gates and they have a wide selection of styles, material textures and colors. Vinyl has excellent durability and strength giving you years of worry free low maintenance.